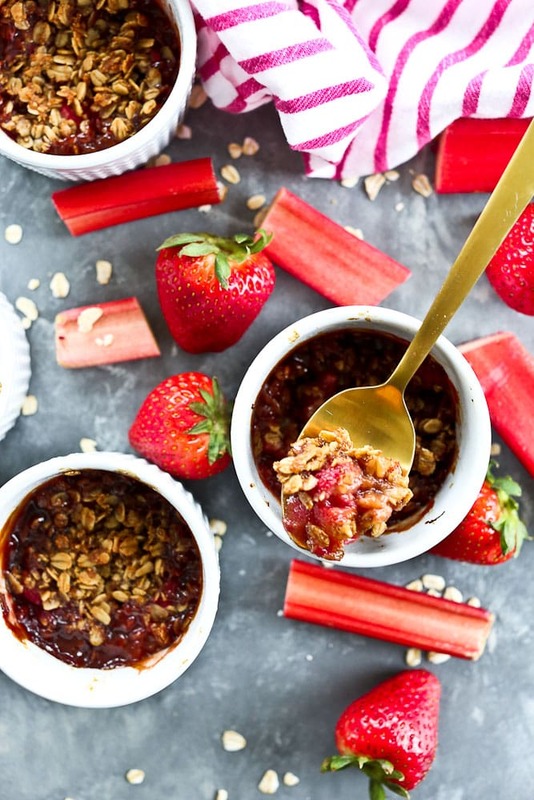 Strawberry and rhubarb are a match made in heaven and it doesn’t get any better than Strawberry Rhubarb Crisp! 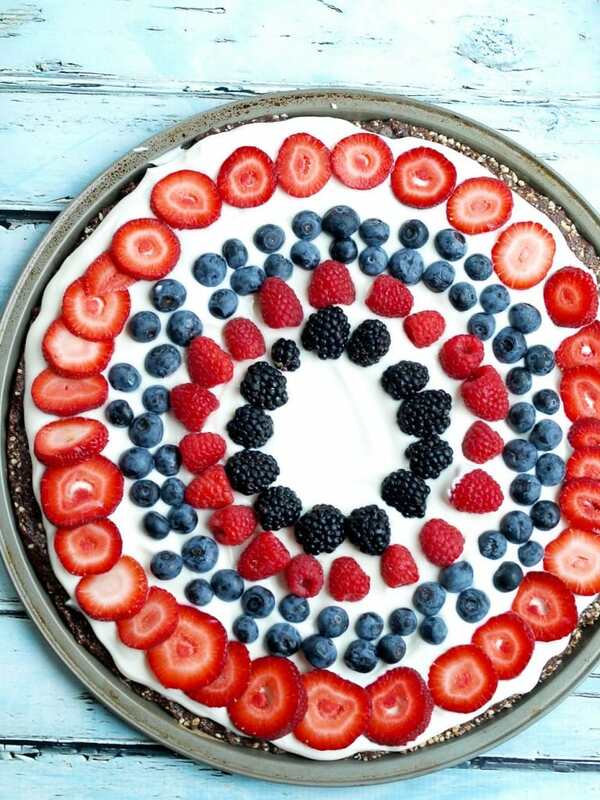 This recipe is easy to make and healthier than most desserts. Heads up! This post was originally published in June 2012. Photos and recipe card were updated April 2018. Enjoy this lovely dessert! Well, hello there! Come on in. Have a seat. Let’s chat. I know, I know. It’s been a while. Last time I posted, I said I was taking a break, but wasn’t sure how long it’d be. I said, “it may be one week or maybe three weeks. I hope not longer, but maybe longer.” Okay, so it fell into the “longer” category. There was some wishful thinking going on there. The good news is: I’m back! 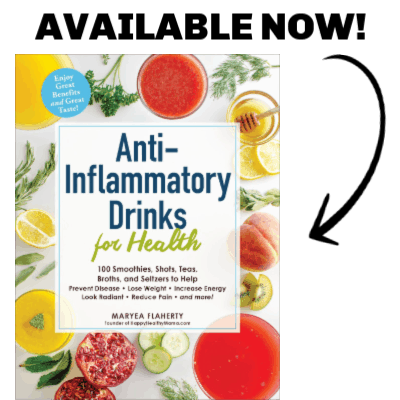 With lots of recipes and fun posts just waiting to be shared. My mind’s been working even when I haven’t been actively posting. The bad news is I won’t be blogging full time. You can expect 2-3 posts a week for now. Eventually I’d love to get back to 4-5 posts a week, but I know that isn’t realistic right now. Now, onto the recipe already! These healthy little individual strawberry rhubarb crisps are the perfect summer dessert. Don’t you just love individual desserts? Not only are they super cute, but they have built-in portion control. I used to eat rhubarb all the time growing up because it grew wild all over our neighborhood. We’d just pick it and bring it home to dip in sugar and eat. I haven’t eaten it that often as an adult, though, and it was strange to purchase it in the grocery store. I loved getting reacquainted with this under-appreciated vegetable (yep, it’s a vegetable that’s most often treated like a fruit). Strawberry and rhubarb are a perfect dessert combination. I use them in equal parts here and the sweetness of the strawberry balances the tartness of the rhubarb. 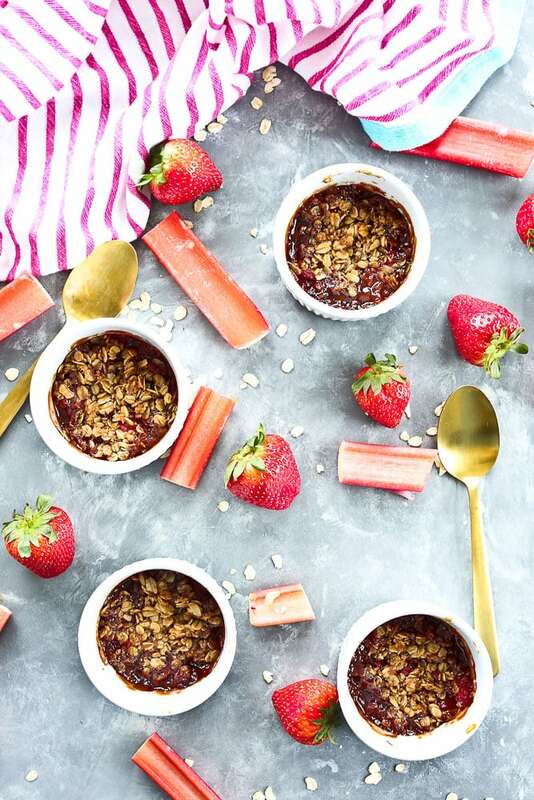 This Strawberry Rhubarb crisp recipe has much less sugar than normal crisps, making it a light, healthy summer dessert. I also used brown rice flour to make it gluten-free, but you can use whole wheat or all-purpose flour if you prefer. 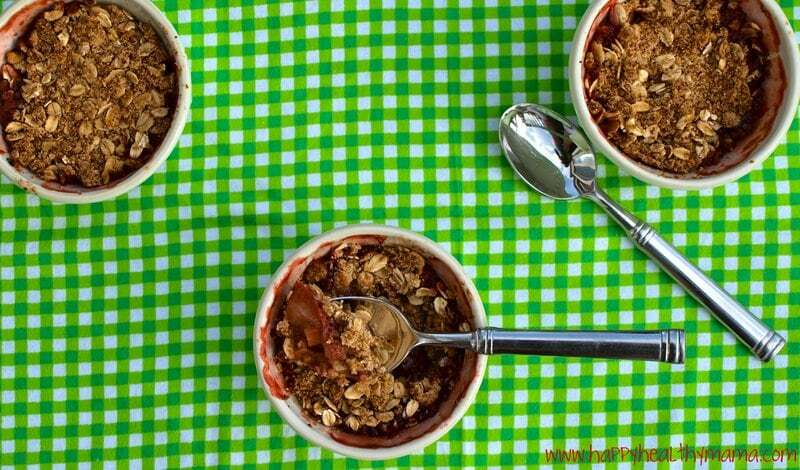 I just know your whole family is going to love this Strawberry Rhubarb Crisp recipe! Preheat the oven to 375 degrees. Lightly oil 4 ramekins. In a medium bowl, whisk together 1/2 cup flour, oats, sucanat,* cinnamon, and salt. Add the coconut oil, water, and vanilla and use your hands to mix them together. You’ll need to use your fingers to break up the coconut oil and incorporate it. Set aside. In a medium bowl, mix together the chopped strawberries, chopped rhubarb, orange juice and zest, 3 tablespoons flour, and sucanat. * Stir to combine well. Divide the filling mixture evenly in the four ramekins. (This would also work in a small baking dish if you don’t have ramekins.) Top each ramekin with 1/4 of the topping mixture. Place the ramekins on a cookie sheet and bake in the preheated oven for 35-40 minutes, or until the top is browned and the juices are bubbling. Enjoy! 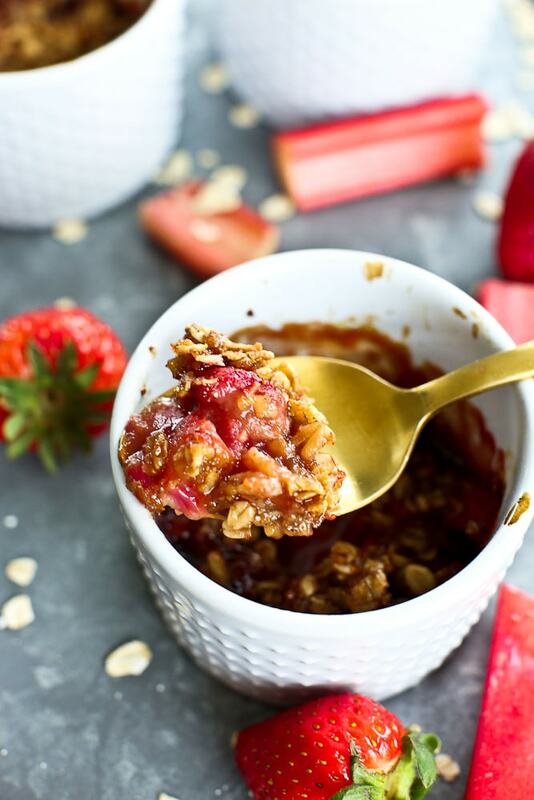 If you make this Strawberry Rhubarb Crisp recipe, or any Happy Healthy Mama recipe, I would LOVE to see it! Please take a pic and share it on Instagram or the Happy Healthy Mama Facebook page and tag me @happyhealthymama and hashtag it with #happyhealthymama? 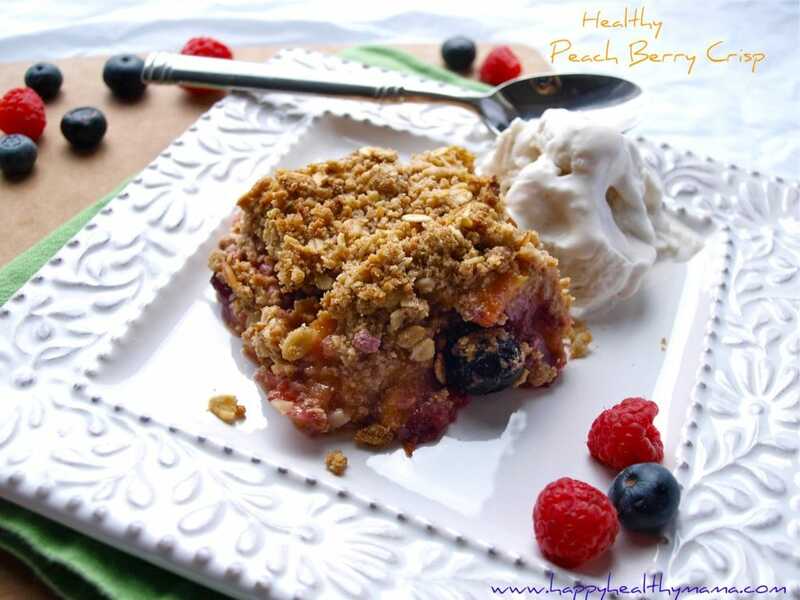 I love seeing what the Happy Healthy Mama community is cooking and baking! In other news, I contributed a guest post for Heather at Fit Mama Real Food yesterday giving tips for how I stay healthy as a mom. Check it out! Heather just had her first baby and even if you aren’t interested in my tips, you gotta check out her adorable little baby boy! I’m not sure if I’ve ever had rhubarb. It looks good though! And I like your guest post too! Rhubarb has an interesting flavor. It’s really tart. You’ll have to give it a try sometime. Welcome back! 🙂 I totally consider posting 2-3 times a week an amazing accomplishment- I can’t pull it off and I haven’t even been graced with our lovely bundle yet….. You brought in one delicious combination for your first post back! I never would have been able to blog when I was teaching full time! You have a whole classroom of little ones! Welcome back! You’ve been greatly missed, even though your guest posts have done a wonderful job. Rubarb + strawberries is a big favorite of mine and last week I made a rustic galette filled with rubarb and nectarines. I used coconut oil in my crust and I can imagine that the flavors might be simular to your crisp. Can’t wait to give it a try! I’ve been looking for something to do with rhubarb as a first time rhubarb-ish something-attempt that was easy. Jam wasn’t calling to me… pie was too much work… but then this? Oh yes, I can do this. I’m glad you’re back! 2-3 times a week is still an accomplishment! Thanks, Kelli. It’s crazy how much time blogging can take. I’ve really missed it, though! Welcome back! I hope you had a great break. I have actually never tried rhubarb before but this looks good. Thanks, Diane! My mom made strawberry rhubarb pie all the time when I was growing up, but I wanted something simpler. I’ve only had rhubarb once, but I loved it. These look awesome! I love a good gluten-free dessert. This sounds wonderful! I’m terrible at sticking to a schedule, too. I’m trying to consolidate the time I spend on blogging things into bigger chunks of time. It seems to be working better so far! Glad to see you back and feeling better! This dish looks delicious and I’ll have to give it a try! As for the blogging, just do what you can, I will continue reading. :-). I have still been reading through your week by week pregnancy entries and it’s been very helpful for me. I wish I would of been able to keep up with mine more but it just wasn’t possible. I’m at 35 weeks now and feeling pretty fatigued. Thanks for all your wonderful post! This was so delicious I just had to comment. Ever since I was 12 and the man at the grocery store told me that strawberry rhubarb is the best pie ever I’ve wanted to try this fantastic combo. Unfortunately, the store didn’t carry strawberry rhubarb pies. I’m 16 now and when I saw rhubarb at whole foods I knew the time had come to finally fulfill my wish 🙂 I doubled your filling recipe, but I kept the orange zest at 1 tbsp. (because I was zesting my orange using the old spoon trick and didn’t want to scrape more ahaha) and subbed xylitol (around 1/4 cup + 1 tsp). For the crisp I used a recipe from Experience Life magazine because it matched my dietary needs (I subbed xylitol for the sugar) Oh my goodness, this might be my new favorite dessert! 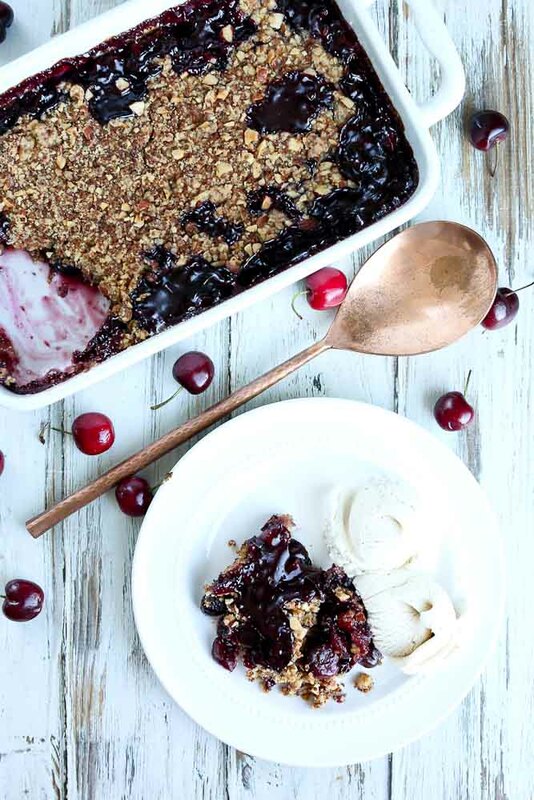 Here is the crumble recipe if anyone is interested- it is the cleanest one I have found, and it’s quite tasty! Pulse 1 cup oats, sweetener, cinnamon, and oil in a food processor until it can be compressed into a crumble. Pulse in the pecans and gently stir in the remaining 1/2 cup oats. Sprinkle over the top of the fruit filling.